Is there any noticeable difference in rigidity between the standard S03 and the XL/XXL versions? The reason I ask is that I like the added size the upgrades allow (for carving small signage) but wouldn’t want the machine to be less effective at shaping aluminum (carving emblems and small parts, for example). Does anyone mill aluminum with an XXL or do the longer rails introduce too much flex? 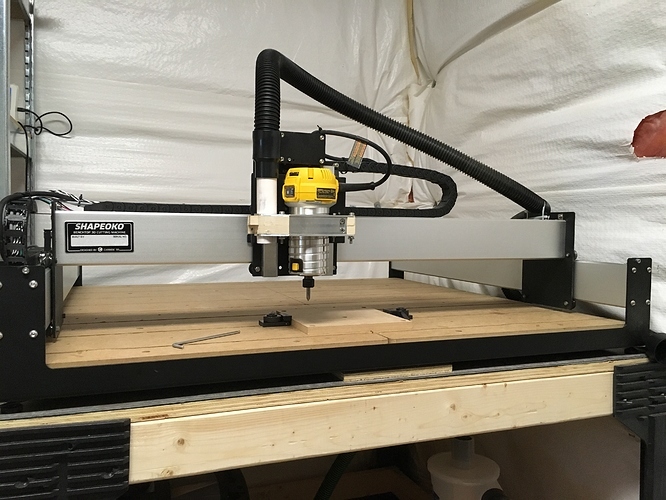 The SO3 rails proved out via Finite Element Analysis to be good unsupported up to a 5’ x 5’ machine — @chamnit can further elaborate on that, since he did the calculations. The rails will not flex significantly on the XXL. No more than 0.001" for even the heaviest of cutting loads. You’ll see more deflection in the bearings and guides, which is the same design as on the standard SO3. In theory, you’ll see very little difference between the standard and XXL. I upgraded my standard S03 to the XXL. I noticed no difference in the rigidity of the rails, however there is considerable flex in the base. The base only has 4 feet, or contact points. It should probably have 8 or more. You can press on the stock waste board with your finger and see the flex. My solution was to add additional layers on top of the stock waste board and screw them together in an effort to stiffen it up. You can also slide a 1/2 x 8 x 40 piece of plywood under the centerline of the XXL, and then adjust the four feet to level.